Jesse works as a structural engineer for Pennoni in the Philadelphia headquarters, where he primarily performs design, rehab/retrofit, and analysis of bridges. He is very thankful for the opportunity to work on some excellent local bridge replacement projects, including the Lock Street over the Manayunk Canal, SEPTA's Crum Creek Viaduct, and 20th Street over the Benjamin Franklin Parkway, as well as numerous repair projects on the Tacony-Palmyra and Burlington-Bristol Bridges over the Delaware River and the rehabilitation of the Blueball Avenue over I-95. He is an advocate for resilient design and sustainable procurement practices, as well as advancing technologies in professional practice. Jess received his BS in Architectural Engineering and MS in Civil (Structural) Engineering from Drexel University in 2010. He is a licensed Professional Engineer in PA and NJ, a PennDOT-certified Bridge Safety Inspector, and a certified Envision Sustainability Professional. He also serves on a variety of ASCE committees at the national-level, including the Committee on Younger Members (CYM), for which he currently serves as Chair and Eastern Geographic Member, representing younger members in Regions 1, 2, 4, and 5 and facilitating the annual planning for the Eastern Regional Younger Member Council. In his free time, Jesse is an avid ultimate (frisbee) player and runner. He resides in Havertown, PA, with his beautiful wife, Christina, and daughter, Sadie. He does not like cheese. Scott is a civil engineer in the transportation department at Michael Baker International. Scott graduated from Widener University in 2009 with a BS in Civil Engineering and completed his Master's degree in Civil and Environmental Engineering from Villanova University in 2014. Scott is the Project Manager for several projects in the City of Philadelphia and Municipal Projects in Montgomery County. Scott has worked on many projects for PennDOT including highway relocations, highway restoration, and intersection improvements. Scott is currently the lead highway engineer for corridor and intersection improvements along SR 222 in Berks County for PennDOT District 5-0. Outside of the office, Scott enjoys spending time with his friends, traveling, going to Phillies games, playing soccer, golfing, and running. Katrina graduated from the Georgia Institute of Technology in 2010 with a BS in Civil Engineering. Currently, she works for McCormick Taylor as a Transportation Specialist involved in project management and various communications efforts across Pennsylvania and New Jersey. Prior to McCormick Taylor, Katrina has worked for the Delaware Valley Regional Planning Commission (DVRPC) as a Consultant Project Manager for PennDOT and the Georgia Department of Transportation in Atlanta, GA.
Outside of the office, Katrina enjoys biking, traveling, and attending sporting events (preferably the New York Yankees) with her family and friends. Tim works for Pennoni in Philadelphia. As a highway engineer, Tim is involved in various general roadway design tasks, traffic control planning, the design and inspection of ADA-accessible facilities, and the design and review of highway access improvements. He has worked for Pennoni for three years. Tim is a licensed Engineer in Training and Envision Sustainability Professional, holds a Bachelor of Civil Engineering degree from the University of Delaware, and is currently pursuing both a Master of Science in Civil Engineering degree and a Sustainable Engineering Certificate from Villanova University. In his spare time, Tim enjoys traveling, running, drinking (black) coffee, reading, and rooting for the various Philadelphia sports teams. He is also a member of ASCE's Committee on Sustainability. Dennis works for McCormick Taylor as a Transportation Engineer in their Philadelphia headquarters. Dennis has been with McCormick Taylor for 6 years now, and has gained experience in a number of specialized areas. In his time in the Highway Department, Dennis has assisted on projects pertaining to intersection improvement, highway rehabilitation, interchange reconstruction, stormwater management, ADA curb ramp design and inspection, and right-of-way planning. He also has experience with final design, cost estimates, and preparing PS&E submissions for PennDOT. Dennis graduated from the University of Pittsburgh in 2012 with a Bachelor of Science in Civil and Environmental Engineering. During his time at Pitt, Dennis participated on the club ice hockey team, and completed his senior design project in the rain forest of Ecuador. In addition to his current role on the YMF Board, Dennis also plays an active role in the Engineers' Club of Philadelphia, serving as the Club's Secretary, as well as a member of its Committee on Younger Members, and Communications Committee. In his spare time, Dennis enjoys traveling, playing sports (ice hockey, golf, softball), and checking out new bars and restaurants with friends. Sean works as an Associate Bridge Engineer at Pennoni in the Philadelphia office. He has five years of experience designing and inspecting bridges and other transportation related structures. Prior to joining Pennoni, Sean worked as a structural engineer for WSP. Sean graduated with a B.S. in Civil Engineering from the University of Maryland in 2013 and a M.S. in Civil Engineering from Villanova University in 2017. He is also a registered Professional Engineer in PA, a PennDOT Certified Bridge Safety Inspector, and a certified Envision Sustainability Professional. In his free time, Sean enjoys running, exercising, golfing, skiing, traveling, watching Philly sports, playing the guitar and spending time with friends and family. Dani graduated from Drexel University in 2017 and received her Bachelor of Science and Master of Science in Civil Engineering through their accelerated degree program. She currently works as a Graduate Bridge Engineer in the Philadelphia Transportation Division. Dani has worked at Pennoni since September 2014, first as a Drexel co-op, then part-time, before starting full-time in July 2017. She is a PennDOT-certified Bridge Safety Inspector and a licensed Engineer in Training. Dani is an advocate for STEM outreach, especially to inspire more women to pursue an engineering degree and frequently volunteers at outreach events. Outside of ASCE, she is also an active member of Women's Transportation Seminar (WTS) and a board member for Philadelphia Society of Women Engineers (SWE). In her spare time, Dani enjoys long walks down the aisles of Target, watching the Philadelphia Eagles with family and friends, and exploring all that Philly has to offer (especially food). Kevin graduated from Temple University in 2014 with his Bachelor of Science in Civil Engineering degree. Kevin held both private and public engineering and inspection internships while pursuing his civil engineering degree. Kevin works in the Transportation Division of Pennoni Associates as a graduate highway and traffic engineer at the Philadelphia headquarters. In his free time, Kevin enjoys golfing, cooking, biking and traveling. Ajin graduated from Drexel university in 2015 with a B.S in Civil Engineering and Engineering Management. Currently, she is working at Mulhern and Kulp Structural Engineering as a staff engineer. Her responsibilities are to design the lateral and gravity components of single and multi-family houses. She also interacts with the clients on a regular basis to ensure that they are provided with the utmost services, while keeping the design safe and cost effective. Ajin enjoys applying the theory to solve the real world problems and learning from professionals. In her spare time, Ajin likes to travel, learn more about different cultures, hang out with her friends and family, and try out different restaurants. She also likes to play squash. Nick graduated from University of California, San Diego in 2015 with a B.S. in Structural Engineering. Nick moved to Philadelphia for a Structural Engineer position with AECOM. In his free time, Nick likes to play and watch sports, check out new restaurants and bars, experience live music, and hang out with friends. Kirsten is currently an aviation designer for Urban Engineers working on a variety of projects in the northeast region. She works on airside and landside projects both in design and construction. She has worked with several airports, including PHL, TTN, CGS, and NFAFB. Previously she was a bridge engineer for Walsh Construction on the P3 Rapid Bridge Replacement project. She has a BS in Civil Engineering and a BS in Architectural Engineering from Drexel University class of 2015. Kirsten is also on the WTS board as the Symposium task leader and is co-president of UYMF (Urban Engineer's younger member forum). In her personal time she enjoys traveling as much as possible, dancing, yoga, finding new fitness gyms, and eating all the best food in the city. Paige Glassman is a transportation planning specialist at Traffic Planning & Design located in Philadelphia, PA. She graduated from the University of Delaware in 2013 with a degree in Civil Engineering, and received her Master’s in Civil Engineering from Villanova University in 2018. Prior to working at TPD, Paige worked as a traffic engineer at Pennoni. Paige is entering her fifth year on the YMF board, previously serving as College Contacts chair from 2014-2017, and currently serving as the Society Liaison chair, as well as the head of YMF’s table at the GETT (Girl’s Exploring Tomorrow’s Technology) Expo. In her spare time, she enjoys completing jigsaw puzzles, writing haikus, going down the shore and spending time with family and friends. Lindsay graduated from the University of Connecticut in 2013 with her Bachelor of Science in Civil Engineering. She is currently an Engineer of Structures at Amtrak with a focus on bridge inspection, design, and management. Prior to her return to the railroad, Lindsay worked as an Associate Bridge Engineer in the Transportation Division of Pennoni Associates and as a Management Associate Engineer for the Bridge Production/Construction Department of Amtrak. In her spare time, she enjoys traveling, spending time with friends and family, exploring Philadelphia's unique beer scene, and crafting unsuccessful Pinterest DIYs. John is a Highway and Trail Designer at Traffic Planning and Design, Inc. He has been with TPD since May of 2016 after graduating from the University of Pittsburgh with a Bachelors in Civil and Environmental Engineering. In his spare time, John enjoys following Philly sports, going to concerts, and hanging out with family and friends. Cricket graduated in 2016 from Johns Hopkins University with a Bachelor of Science in Civil Engineering and a minor in Entrepreneurship and Management. In 2017, she earned a Masters of Science in Engineering Management also from Johns Hopkins University. Currently, she works as a Junior Structural Engineer in the Telecommunication Division of Advantage Engineers. She also volunteers as the Assistant Secretary for the ASCE Philadelphia Section Board and leads the Philadelphia PR effort for the 2018 PA Infrastructure Report Card release. New to Philadelphia, she has enjoyed getting to know the city through ASCE and visiting the local dog parks with her Great Dane, Wendy. Jacob currently works for Pennoni Associates in the Philadelphia Transportation Department. He specializes in traffic engineering primarily working on traffic studies, signal design, and maintenance and protection of traffic projects. He obtained a B.S. in Civil Engineering from Temple University, and has obtained his EIT certificate. Jacob is also a member of the Engineers’ Club of Philadelphia, and serves on its Committee on Younger Members. In his free time, Jacob enjoys fishing, golfing, playing music, and hanging out with friends and family. Joe is a Senior Project Implementation Engineer at DVRPC, and has 10 years of experience as a civil engineer in the Pennsylvania and Delaware transportation industries. Joe received his Bachelors and Masters of Civil Engineering at the University of Delaware. Prior to joining DVRPC, Joe spent five years at WSP in Philadelphia in their structures group, and five years at the Delaware Department of Transportation in their Bridge Design section. In his spare time, Joe is a photographer, woodworker, gamer, and hiker. He also enjoys running, concerts, and football. Joe also serves as the Section's Webmaster, Assistant Treasurer, and Director ('16-'18), and is the Community Service Chair for the YMF Board, and Co-Chair of the MRLC/ERYMC 2020 Conference. Assunta graduated from Drexel University in 2016 with a Bachelor of Science in Civil Engineering. Prior to Drexel, Assunta spent two years in the engineering program at the Community College of Philadelphia. While at CCP, Assunta realized her passion for working with students and engaging them in engineering topics. She is currently a transportation engineer at AECOM in Philadelphia, specializing in general engineering consulting contracts with CSX Transportation and Norfolk Southern. Assunta is also an active member of the Women's Transportation Seminar (WTS) and an ACE mentor at Spring-Ford High School in Royersford, PA. In her spare time, Assunta enjoys collecting model trains, spending time with family and friends, going to concerts, baking and running. She is also an avid railroad enthusiast and hopes to one day learn how to operate a diesel locomotive. Caroline earned her BS in Civil Engineering with a concentration in Environmental Engineering from Temple University in 2016. While at Temple, Caroline was an active member of the ASCE student chapter, serving as Treasurer for two years. She currently works as a civil designer at Hunt Engineering Company, focusing on site design, permitting and approval, erosion and sediment control, and stormwater management. In her free time, Caroline enjoys running, traveling, reading, and exploring new restaurants in the city. HuYoung graduated from the Pennsylvania State University, University Park with a BS in Civil Engineering with Structural emphasis in 2015. While he was in active military service, HuYoung was deployed as a field engineer for MINUSTAH (United Nations Stabilization Mission in Haiti) where he participated in highway, bridge and building reconstruction projects after teh devastating earthquake in 2010. He was also actively involved with local orphanages in Port-au-Prince where he cleaned and taught English during his service in Haiti. HuYoung currently serves as a Project Engineer at Timothy Haahs and Associates, Inc. where he performs design calculations for precast, cast-in-place and steel prepares specifications and construction documents for parking structures, mixed-use buildings and their foundations. HuYoung also performs construction administration services related to shop drawing review and field visits for new design projects as well as restoration projects. In his spare time, HuYoung enjoys cooking, camping and playing tennis and soccer. Nha has over 5 years of experience working in the field of water resources engineering within the public sector. At the Philadelphia Water Department, his main responsibility is to coordinate work products that support short and long term capital improvement projects related to flood risk management and resiliency. He holds a BS in Civil Engineering '10, MS in Civil Engineering '12, and is completing his MBA '17 - all from Villanova University. In 2016, Nha was able to celebrate a Villanova Basketball National Championship. He has held numerous positions with the ASCE Philly YMF. From organizing social events, being a coordinator for the CivE Club, and managing the budget, as well as being extensively involved in the many YMF activities, Nha has been fortunate to learn from these involvements to fulfill the role of President for the 2017-18 fiscal year. 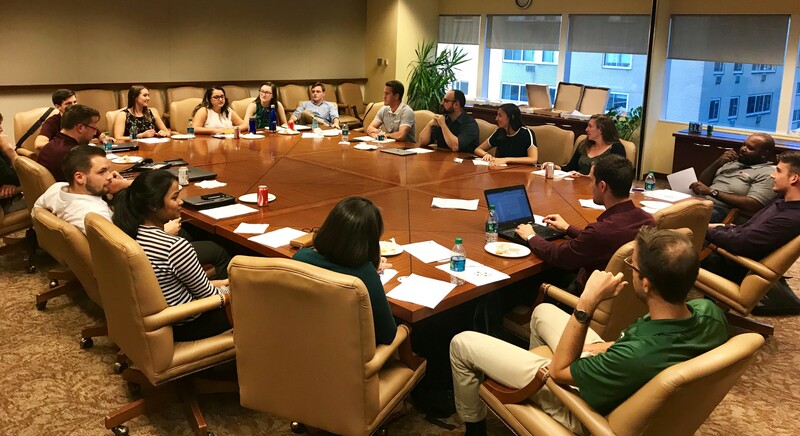 Moving forward, Nha is excited to work with the YMF board to offer professional development, networking, and community outreach opportunities for the local young civil engineering community. Kevin graduated from Widener University with a Bachelor of Science degree in Civil Engineering in 2009 and he went on to obtain his Masters of Engineering degree in Civil Engineering from Widener in 2014. Kevin is working for Vaughan Buckley Construction as a Site Construction Manager where he manages site preparation and foundation work in and around the Philadelphia area for one of the area's top modular builders. In addition, Kevin serves as the practitioner advisor for both Widener and Temple University and he serves as a corresponding member of ASCE's Committee on Student Members.